On a snowy Friday afternoon after a long morning of work and classes, more than 50 people crammed into a room at the Michigan State University Police Station on Jan. 25. The speaker once walked beside civil rights activist, Dr. Martin Luther King Jr., in East Lansing in 1967. One would say he was Dr. King’s righthand man. Dr. Robert L. Green, who has a doctorate in educational psychology from Michigan State University, a B.A. and M.A. from San Francisco State College, and who worked as an education director of the Southern Christian Leadership Conference with King, shared his story. He stressed the importance of education, respect and how to overcome fear. Dr. Green at his speech in East Lansing on January 25th. Growing up in a time of social injustice and segregation was a harsh reality for Green. King aborted his own assassination that day and infused the quality of overcoming fear in Green. He showed Green he must fight his fear and protest nonviolently, even while frustrated. Winning equal treatment was a challenge for families of color. Green said people would deny him job opportunities despite his scholastic achievements and, when traveling, some hotels would deny him service. These barriers could tear some individuals down, but not the Green family. He was determined to overcome this adversity and his family became the first to integrate East Lansing. Green, made sure his kids took school seriously. 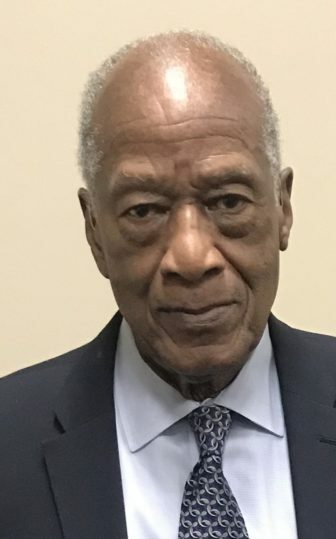 His son, Robert Green, a lawyer who goes by Vincent, was at the Jan. 25 speech and said his dad instilled education into him and his brothers at a young age. All have college degrees. “We came from a family that really believed in education. We have a bunch of law degrees and Ph.Ds in our family and that was the biggest thing that impacted me and my brothers,” Vincent Green said. The way Dr. Green viewed King is the way many people view Dr. Green today. His message touched Michigan State sophomore Katie Montroy, who attended the talk at the MSU Police Station. The talk was organized by the MSU Police Inclusion and Anti-Bias Unit, which Sgt. Florene McGlothian-Taylor leads, with support from the College of Communication Arts and Sciences Inclusiveness Committee. Geri Alumit Zeldes, Ph.D.,leads the committee. “When going to this event, I thought it was just going to be an event that stated the facts, but Dr. Green was really personable, and it gave me a better picture about his points. I got chills listening to the things he went through and how successful he is now. He has experienced a lot of hatred and to still have the desire to spread love to others … It truly is inspirational,” Montroy said. Not only does Green share his story with others, but he is doing a project proposal with James Madison College student, Edmund Rushton. Rushton said he met Green in October of 2017 and they are working on a policy proposal to send to Detroit Mayor Mike Duggan or Abdul El-Sayed, who ran for governor. The proposal calls for abolishing occupancy clauses in private prison contracts. Rushton said Green, “has had an immense impact on my life. He is a very sharp man. Three years ago I was working for the Republican party helping with their presidential election, but some things happened” that disillusioned him. According to Rushton, Green has taught him to be curious and to look into history. Green told him he should understand the history of his country because many incidents are left out in schools. “He taught me if there was a vague history on an American institution, then I should look into it myself because many times key details are left out and people are unaware. Depending on where you grow up, people tend to have different angles than others, which is why we need to learn both sides of the spectrum,” Rushton said. Nearing the end of the speech, the audience was still engaged and smiling. “Hearing this speech makes me want to share the message that going to class is a privilege and we shouldn’t take it for granted,” Montroy said. Green is now retired, but continues to work for education and social justice. Green has written many books and his latest, “At the Crossroads of Fear and Freedom: The Fight for Social and Educational Justice,” shows readers what to do when freedom, fear, equality and education overlap. Green wants to continue to be an inspiration to anyone who comes his way. Lea is sophomore journalism student at Michigan State University with a minor in sports and broadcast journalism. She plans to graduate in 2021 with a bachelor's degree and pursue her career in sports broadcasting. She is currently an intern at Fox47 News and loves to write as well. Transgender activists and allies gathered at the state Capitol on March 31, also known as the International Transgender Day of Visibility. Michigan activist Rachel Crandall-Crocker created the day in 2009 and spoke in Lanising.